CalTrans is planning to widen the freeway from Mussel Shoals to Bates Road, 'the Rincon' in northern Ventura County. The Ventura County Chapter of the Surfrider Foundation has been involved in this issue for the past few years, attending the public meetings and commenting on the planning process. 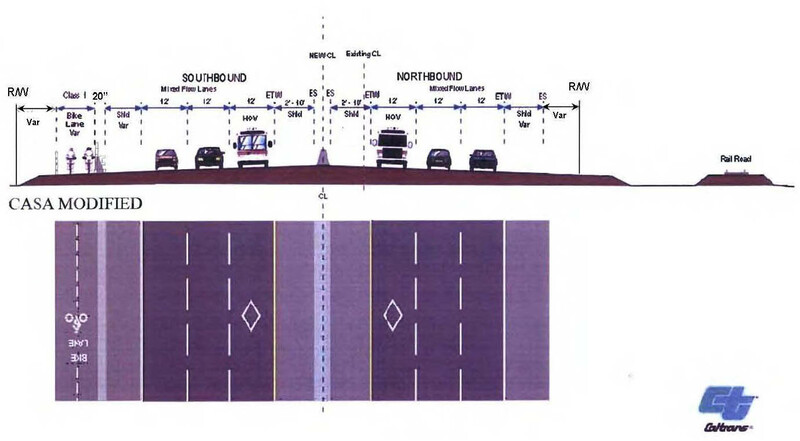 The Caltrans plan aims to reduce traffic congestion by turning the 4 lane highway into a 6 lane freeway, with HOV (High Occupancy Vehicle) lanes. 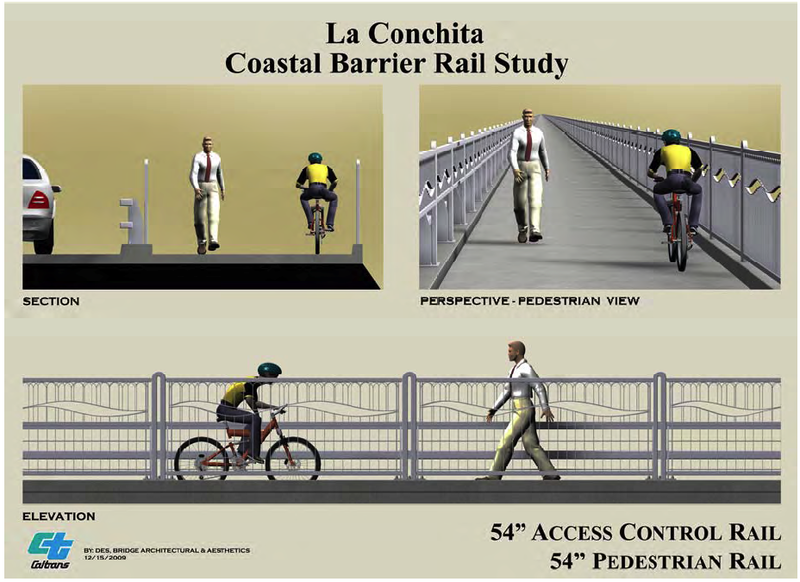 Four miles of California Coastal Trail (CCT) bikeway, separated from the highway by see-through safety barriers and railings designed to maximize views to the ocean. Removal of existing shoulder concrete barrier. Construct concrete median in a context sensitive tone. Development of beach access points at Bates Road, Rincon Point, State Park, La Conchita, Mussel Shoals, Punta Gorda and Mobil Pier. Additional parking for at least 211 vehicles at Punta Gorda; accessible from 101 with connections to the beach and bikeway/CCT. 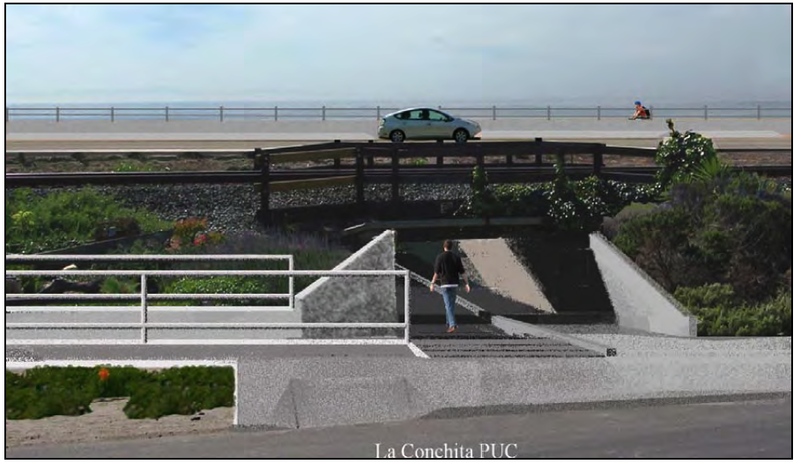 Pedestrian Undercrossing (PUC) at La Conchita with beach and bikeway/CCT connection. Bike racks at Mobil Pier, Punta Gorda, Mussel Shoals and La Conchita. Trash receptacles at La Conchita, Mussel Shoals, Punta Gorda, and Mobil Pier. One toilet facility between Bates Road and Mobil Pier. Revitalization of existing Pedestrian Undercrossing at Punta Gorda. 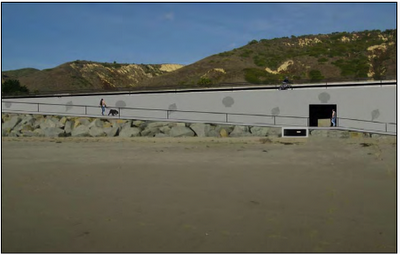 Improved beach access at Mobil Pier. Install Soundwalls at Mussel Shoals that are the shortest length feasible. Install Coastal Access Signage, as appropriate. Include Hotel information sign for the Cliff House Inn. The total cost estimate for the widening project is $151 million. $27 million is the estimated cost for the bike path, ramp and visual enhancements. The map below shows the area with the proposed coastal trail and coastal access points. 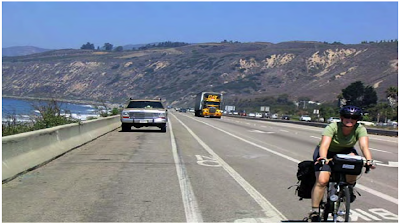 Background: Surfrider testified to CalTrans in 1994 following the fatality of a cyclist on Hwy 101, and at that time we unsuccessfully advocated for construction of a dedicated bike path on the landward side of the freeway, or at the very least a safety barrier for cyclists riding along the highway. The current situation shown here is obviously not safe, although hundreds of cyclists ride this section of highway every week. The original plan after initial stakeholder meetings was for a bike path on the landward side of the freeway and railroad to provide a safe and fast thoroughfare for cyclists between old PCH at Mussel Shoals and Bates Road (Rincon). 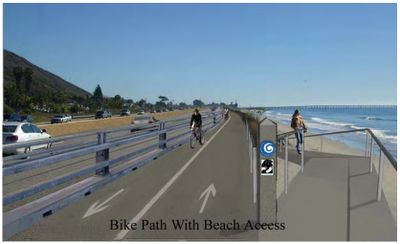 However, in subsequent (closed) meetings, the Coastal Commission had the bike path re-aligned on the beach side in order to realize the goal of constructing a section of the California Coastal Trail on the beach. 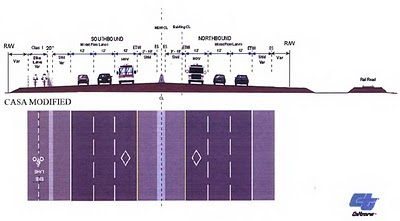 CORRECTION - Because of these concerns, CalTrans will make an exception and continue to allow cyclists to use the new freeway shoulder if they choose. Coastal Access: The project will eliminate beach parking on a 1.2 mile segment of the emergency shoulder near La Conchita beach. 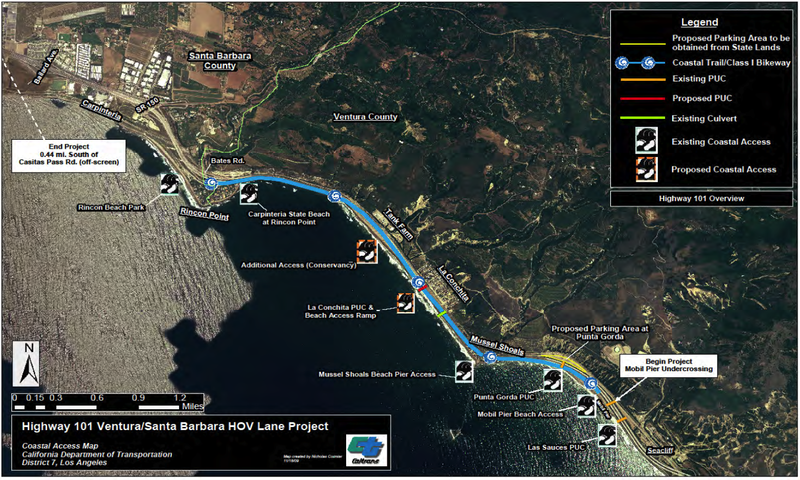 Although Surfrider appealed this issue, CalTrans maintains that on-street parking is available in La Conchita, and a new parking lot at Punta Gorda will offset the loss. For decades the community of La Conchita has been cut off from the beach by the highway. They have used a 4 ft high storm drain under the highway in order to access the beach. The plan calls for this accessway to be enlarged to 8ft x 8ft as shown below. This will be a great asset to the La Conchita community, but once the new accessway is completed, this community will be impacted with beach parking on their streets. CalTrans did not pursue options to construct a new parking lot in or near this new coastal access point. 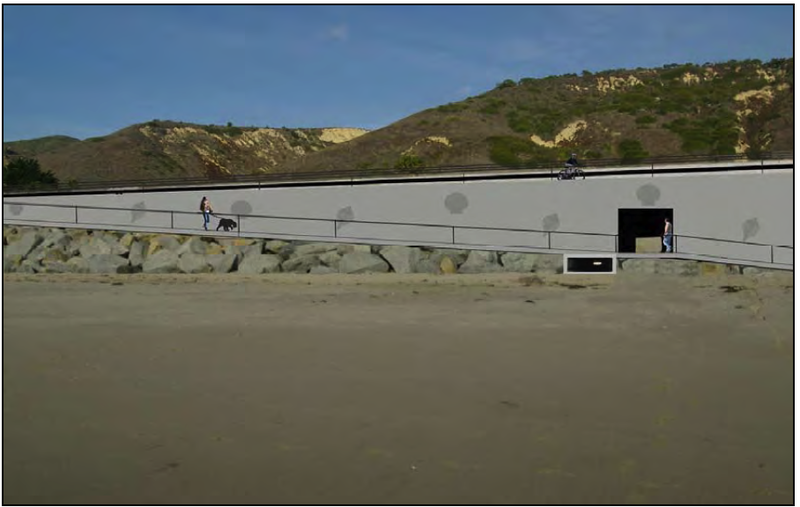 The most recent drawings show that the beach access ramp will encroach onto the public beach, outside the CalTrans Right of Way. Because of these additional concessions and the unlikelihood that there was anything further to gain, the Surfrider executive committee voted not to appeal the project to the Coastal Commission. My opinion? Compromise is a good thing. But only history will tell whether this is a good project or not. 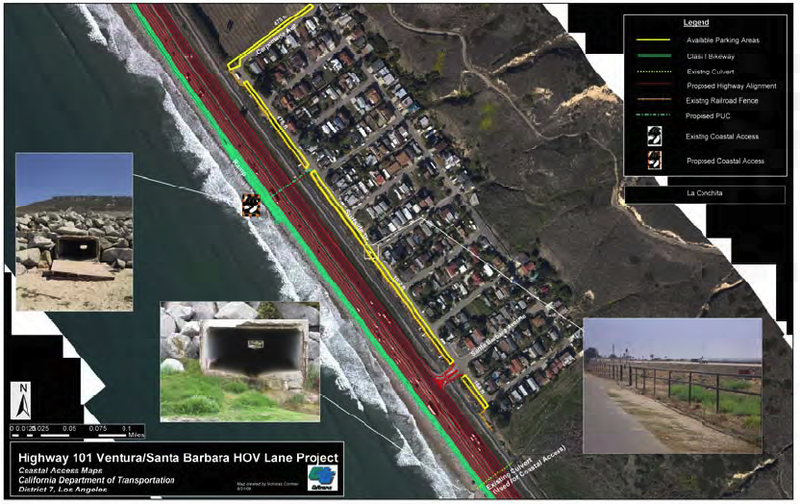 When the 'new' freeway is stop-and-go with cars, waves are breaking over the seawall, and the beach has eroded away, only then may people wonder why there was no discussion of putting in a commuter rail line with the billion dollars used to widen the Ventura-Santa Barbara Hwy 101 in 2005-2015. It happens several times a year. The Santa Clara River estuary fills beyond capacity and finally bursts. When the sand berm breaches, the wetland rapidly drains, and thousands of fish are left high and dry. Last Thursday night the estuary drained rapidly. The timing was right, because Friday morning was scheduled for biologist surveys as part of ongoing studies for the City of Ventura's wastewater treatment plant. The photos here document six of the juvenile steelhead found stranded in the estuary. Although this may appear to be a natural occurrence, this is a highly altered ecosystem. 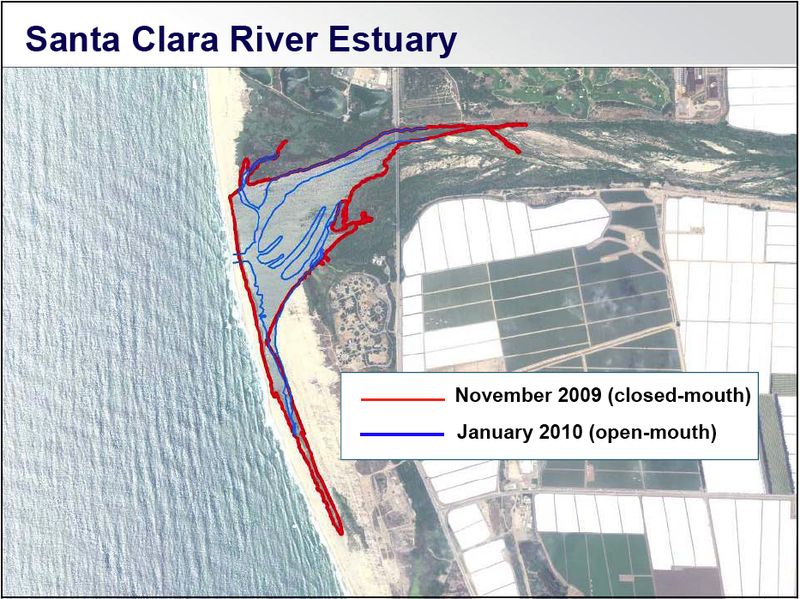 Upstream dams and wells reduce the Santa Clara to a dry riverbed during the summer and fall, while the Ventura wastewater plant delivers millions of gallons a day of treated effluent directly into the estuary. Under natural circumstances the estuary would reach an equilibrium until the first big rains flush down the river and breach the berm from above, opening the system to the Pacific ocean. But these days it slowly fills beyond capacity, and like a balloon it eventually pops. Humans often help this happen by digging small canals in the sand berm, but large swells and tides accomplish the same end. The result is a huge flush of nutrient-rich water onto the beach, and the death of federally listed species such as steelhead and the tidewater goby. Ironically, it is these two species that have been pitted against each other in the ongoing debate over the management of this estuary. Two separate federal agencies are charged with stewarding the fish - NOAA Fisheries for the steelhead trout, and Fish and Wildlife Service over the tidewater goby. Past decisions have been based upon the need for continued water for the tidewater goby, based upon the fear that reduced flows from the wastewater plant would limit habitat in the estuary. 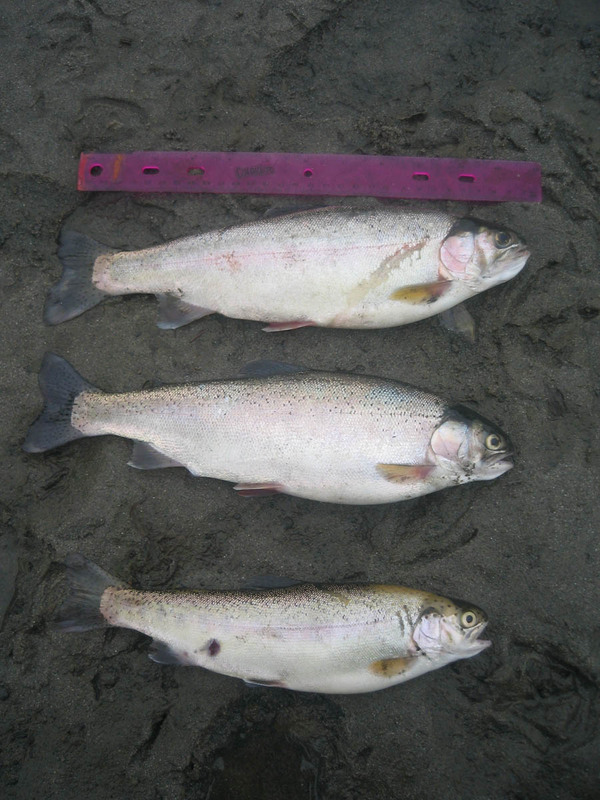 And although steelhead often struggle to get downstream with limited flows past migration barriers, studies have revealed that steelhead rely upon the estuary in order to grow to a size which ensures their survival once they enter the ocean. 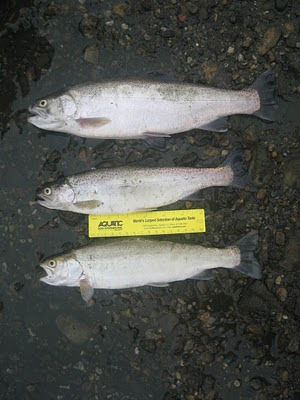 The fish in these photos had grown much larger than they would have in the small freshwater streams. 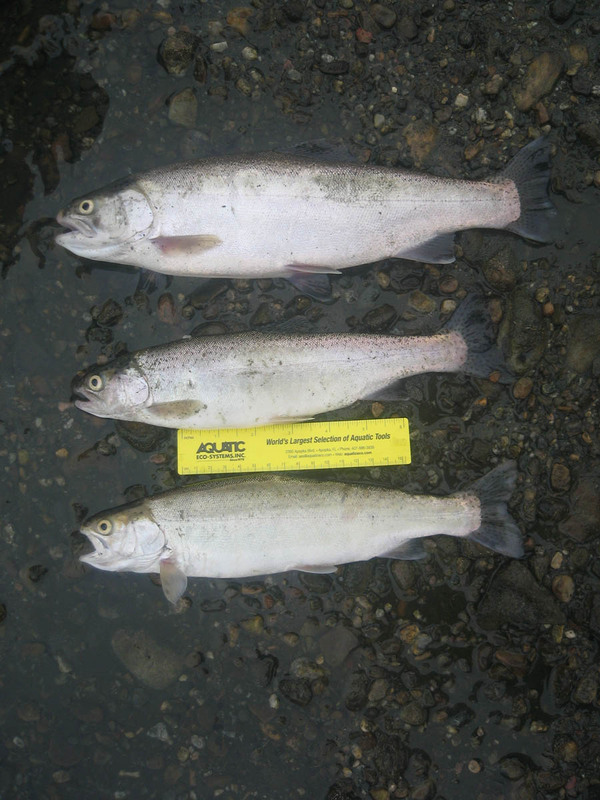 Had the lagoon breached later in the year from high flows in the river, these fish would have successfully entered the ocean with a high probability of returning to spawn in the future. 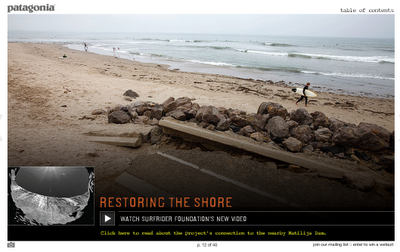 The Surfers' Point Managed Shoreline Retreat project is featured on page 12. Click on the links to view "Restoring the Shore" video, and read about the watershed connections with Matilija Dam. On Wednesday September 8, 2010, our West Coast Ecosystem-based Management Network presented at the California and the World Ocean conference in San Francisco. This is the fourth such conference since 1997, intended to "bring together representatives from government, academia, industry, and the public to share ideas and formulate action strategies for the 21st century." Indeed, the conference was a 'who's who' of coastal and ocean policy, with hundreds of attendees from every sector working on ocean issues. 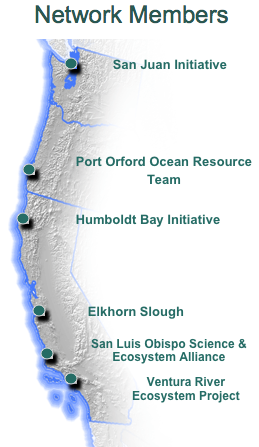 I have attended all of these conferences, and published Managed Shoreline Retreat and Dam Removal: Ecosystem Restoration to Benefit Coastal Resources at CWO '02. of their unique coast-wide partnership. The panel session will also draw distinct parallels to the latest developments in national ocean policy, regional ocean governance and the West Coast Governors’ Agreement on Ocean Health. 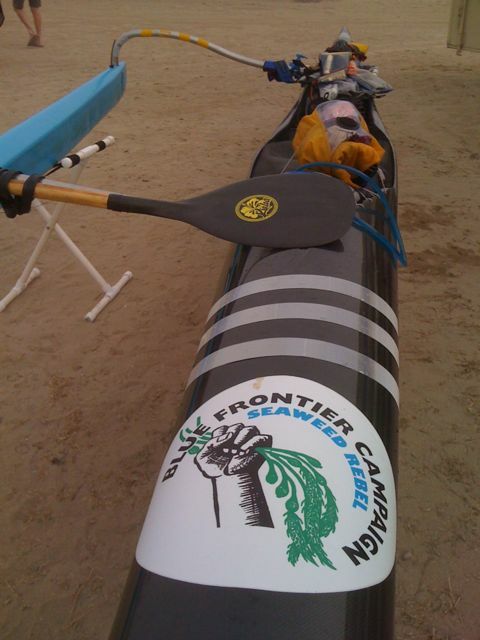 Seattle to San Diego - by canoe - to raise ocean awareness. Margo is one tough woman, on a mission to help the ocean. Knowing she was on the way, I wanted to do my part to welcome her to Ventura and get out the press. 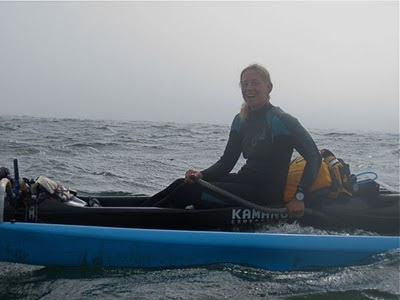 A few e-mails and I had the local paper, KVTA radio, cable TV, a couple of ocean paddlers, as well as contact with the Hokulo Outrigger Canoe Club who I hoped could provide overnight storage for her boat. 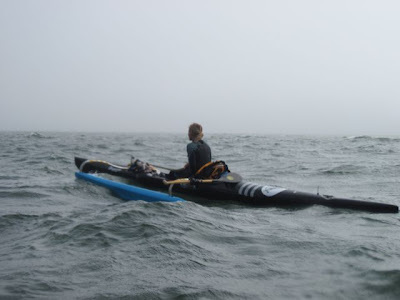 After tracking her progress all day, I put in at Emma Wood and paddled with her for a couple of miles around the mouth of the Ventura River - I had hoped to point out the view looking up the watershed to the 6,000 ft mountains, the land-sea connection to which this blog is dedicated. Although it was sunny and 99 degrees in Ojai, we could hardly see the beach through the thick fog. I came ashore at Surfers Point, releasing Margo from the burden of waiting for me on my slow sit-on-top kayak. The Hokulo crew paddled out to meet her, and the press was there at the Ventura Harbor. 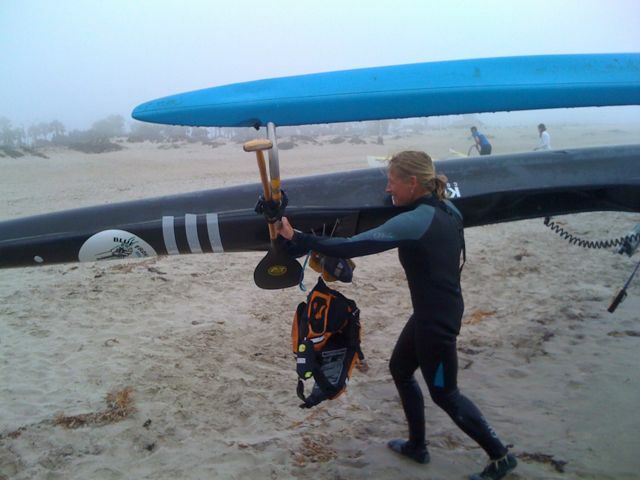 She endured an hour of interviews, obviously cold from her all-day paddle from Santa Barbara. I had organized with June, her one-woman ground support crew, for them to stay in our guest room. After a hot shower we went up to meet with our local Surfriders who were holding a meeting and spaghetti dinner. 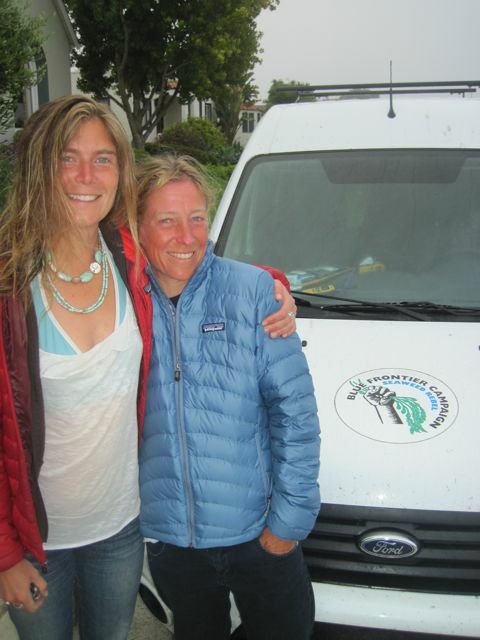 I hope our guests remember Ventura, one of their countless nightly stops on the epic paddle along the Pacific coast. I am in awe of Margo's energy and dedication, and June's steadfast optimism.